Let’s take a deeper look at the importance of LTV, and how we use it at British Pearl to offer you an attractive balance between risk and reward. What does loan-to-value actually mean? LTV is a key number used in the property and finance worlds. It’s a simple but effective measure of the risks involved where borrowing has been used to purchase an asset. 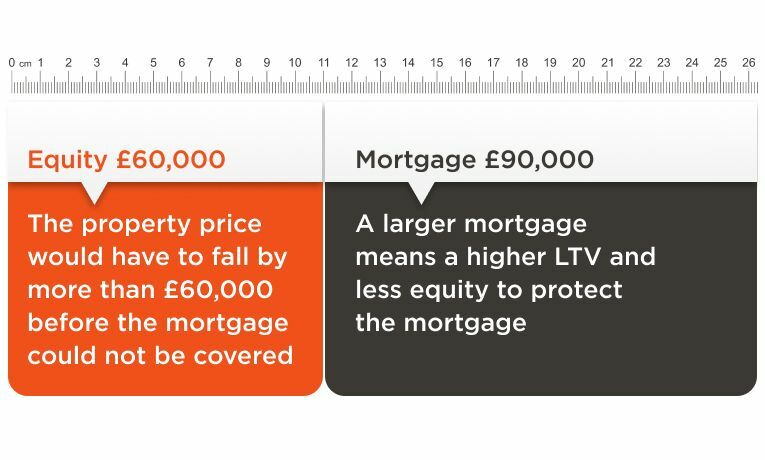 In our case this asset is a property, so the LTV is the size of the mortgage in relation to the value of the property. Over time, as the property price or mortgage amount changes then the LTV will also change. The owner of the property benefits from the equity, which is the difference between the mortgage amount and the property price. When the property is sold the mortgage is paid off first and anything that remains goes to the property owner. So what does the LTV tell us? A higher LTV indicates the loan is riskier, and vice versa. This is because with a higher LTV the amount borrowed is a higher percentage of the property price. If the property price falls there is less of a gap before the total amount of the loan can no longer be repaid. Longer investment terms and higher LTVs generally mean a higher interest rate will be paid. Our interest rates are broadly in line with a similar maturity buy-to-let interest only mortgage rate for the same period. 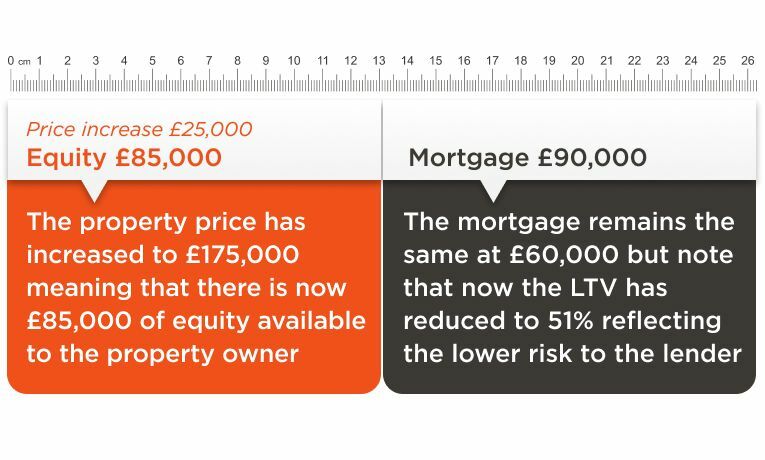 Using our original example, if the property price increases from £150,000 to £175,000, then the LTV reduces to 51% as there is now more equity in the property. In turn this means that the mortgage is more likely to be fully repaid and so reduces the risk. Remember that Loan Investors continue to receive their fixed interest rate as income on a monthly basis. Buy-to-let investors generally purchase their investment properties using a mortgage and we structure our investments in order to replicate that. A higher LTV means that the Share Investors are more exposed to the price fluctuations of the property and therefore take on more risk. Using our original example, if the property price increases from £150,000 to £175,000 it represents a gain of £25,000 or 16.6%. The property owner (equivalent to a Share Investor with British Pearl) faces a different capital return. They receive the full £25,000 but only used £60,000 of funds as a deposit. Their return is 41.6% as a result of the ‘leverage’ within the investment structure. LTV is a measure of that leverage with a higher LTV meaning higher leverage and a higher exposure to property price changes. Remember that Share Investors continue to receive their share of the net property rental income on a monthly basis. British Pearl loans are offered with a current range of initial LTVs from 50-70% (although we have the flexibility to go higher to 75% if appropriate for any specific investment). An LTV of 70% means that the property backing the loan would need to fall in value by 30% before the loan capital could no longer be covered by the value of the security being held against it. To put this in focus, the last period of extreme property market stress was ten years ago during the global financial crisis. Over that period the market showed a large degree of divergence across regions but the headline housing market dropped a little below 19%1. As of March 2019, the weighted average initial LTV of British Pearl investments was 61% and the latest revalued weighted average LTV was 51%2. Against a backdrop of uncertainty, today’s investors want choice and to be able to invest according to their own risk profiles. By offering both share and loan investments with varying investment terms and varying LTV levels we believe that our investors have that flexibility. They are able to make choices and customise their portfolios in terms of income and capital risks. 1 Land Registry data, average house prices in Great Britain fell 18.2% between September 2007 and March 2009. 2 As of March 2019, the initial weighted average LTV of British Pearl investments was 61% and the latest revalued weighted average LTV was 51% using a combination of RICS valuations, Land Registry HPI data and internal BP calculations. When you invest with British Pearl, your capital is at risk and invested sums are not covered by the Financial Services Compensation Scheme (FSCS). Forecasts are not guarantees and performance may vary. Tax treatment depends on individual circumstances and may change. Resale Market trading is subject to demand and price. Read our key risk statement.